Arsenal faces Manchester City this weekend and it is going to be a highly contested game because both clubs have good attacking players. 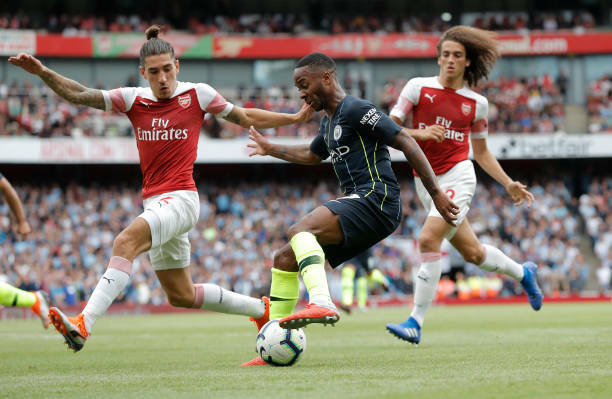 Manchester City will tomorrow welcome Arsenal at the Etihad Stadium and it will be an important game for both sides because one wants to stay in the Premier League title race while the other wants to stay in the top four. So looking at the objectives of these two clubs, it’s quite clear which one has been better this season. Arsenal comes into this match after getting a 2-1 win over Cardiff City and this is great because they will have confidence in themselves while their opponents Manchester City lost their last Premier League game at the hands of Newcastle United. Manchester City will use their best squad since this will be a much-needed win but Unai Emery’s men will also be hoping to avoid some similar embarrassment as that which happened in Liverpool. Arsenal is without Sokratis, Holding, Hector Bellerin and Danny Welbeck due to injuries. Unai Emery will definitely be worried because of these injuries because three of these injured players are defenders who would have been very important on Sunday because Manchester City have many great attacking players. Manchester City will be without Benjamin Mendy and Vincent Kompany because they are still on the sidelines. City’s Ederson got a cut in their game against Newcastle United and he could miss the match on Sunday if it was very serious. The gunners will be hoping to collect all the three points so that they can stay in the Premier League top four because going back to the UEFA Champions League is their main target this season.